Classic barbecue flavors combine to create a tasty taco in this easy slow cooker recipe. 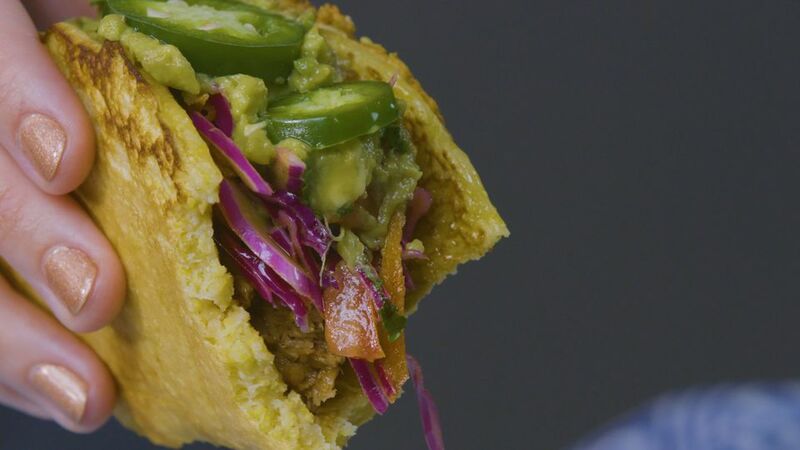 Cornmeal is used to create a cornbread-inspired taco shell (not to be confused with a traditional corn tortilla, which calls for masa harina) and barbecue pulled pork stands in as filling. Your slow cooker does most of the heavy lifting here, making this dish even easier. First, prepare the pulled pork filling. Place half a sliced onion in the bottom of your slow cooker. Stud the pork roast with cloves and season with salt and pepper. Place roast in slow cooker on top of the sliced onion. Add the remaining sliced onion and add enough water to cover. Cover and cook on low 8 to 12 hours, or until the pork is very tender and falling apart. Remove roast. Remove and discard cloves, bone and fat, as well as any water, onions and grease remaining in pot. When the pulled pork is almost ready, prepare the cornbread taco shells. In a bowl, combine cornmeal, all-purpose flour and salt. Then add milk and the egg, and stir until mixture is nicely incorporated. Don’t overwork the batter—some lumps are okay. You want a pretty thick consistency, but still a little runny. If the mixture seems too dry, add a little more milk; if it seems too wet, add a touch more cornmeal. Grease a small skillet with oil and place over medium heat. When the pan is very hot, spoon a small amount of batter into the skillet. Cook the cornbread taco shell 2 to 3 minutes on the first side, then flip, and cook 1 to 2 minutes more on the second side. The taco shells should be soft and flexible. Repeat with remaining batter. Depending on the size of your tacos, recipe should yield 4 to 8 taco shells. To assemble tacos, fill taco shells with the pulled pork, coleslaw, jalapeños and drizzle with lime juice. Serve immediately.